Our first destination was Dikai, the Rappaports' field work location. We walked for several hours over the grass-covered slopes at the headwaters of the Simbai River before entering the rain forest. 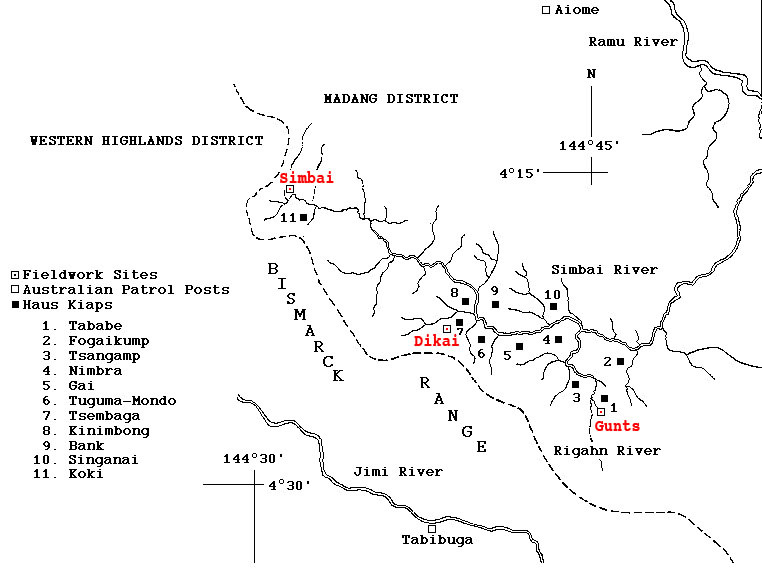 The Kiap Road wound up to ridges and down to streams. Most of the streams were not deep, however the current was very strong. 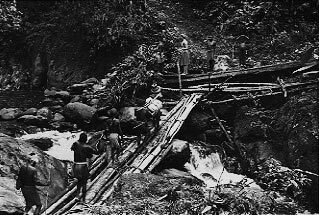 In places where the water was deep enough to reach over a person's knees, bridges had been built in order to make crossing possible. 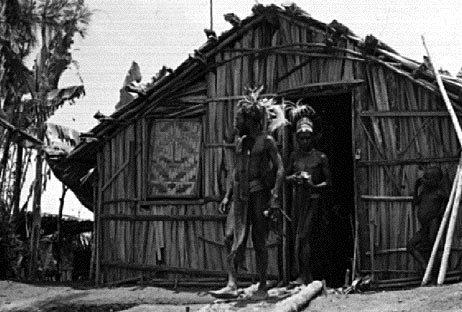 In every clan territory along the Kiap road, the patrol officer had ordered a haus kiap to be built. The patrol officer or other westerners could use these shelters when they were passing through. 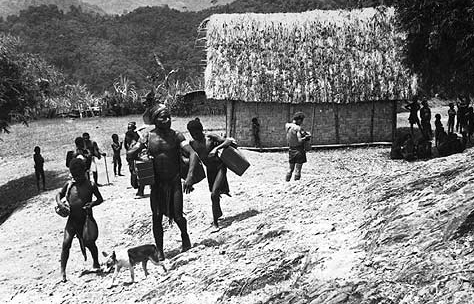 The area around the haus kiap was considered public, and there was plenty of space to set down the cargo and have a rest before setting off again on the long walk. The men themselves had provided the poles and the vines for lashing boxes to the poles. We were surprised that they also bound up small packages including our suitcases. It was done so the loads could be carried over a man's shoulder. One-man loads were limited to 25 pounds. Bigger loads, up to 50 pounds, were fastened to poles and carried by two men. Still larger objects, such as the metal trunks known as "patrol boxes," which were the sturdiest kind of container for breakable equipment, would be carried by four men, alternating two by two. 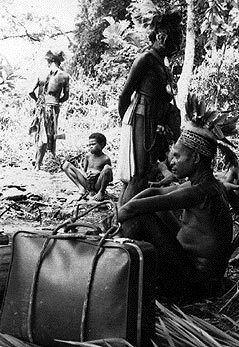 The weight designations had been carefully defined by the Australian Administration in order to avoid the exploitation of local people by the various "Europeans" who might pass through. The Australian Administration had also standardized payment. It was long after sunset when we got to Dikai. It had taken us more than 10 hours to get there. One of Allison's knees had given out. Tultul Mbabi and Tultul Pinj each supported her by one elbow and practically carried her for the last half hour up the last hill to the Rappaports' house. Next morning Allison still could not walk and we stayed on. Kavali and the Rappaports' "work boys" took care of us: fetching and heating water, cooking and even baking fresh bread. 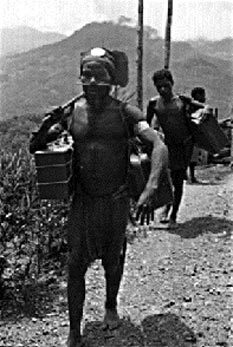 Since the Rappaports were still in Madang, we were able to stay in their house for the five days necessary to recoup our energies. The Rappaports' house had been built with local materials and traditional construction methods. It was just big enough for a small office, a living room/dining room space, shower area, and a bedroom almost entirely taken up by the bed. In the same small clearing in Dikai, facing the Rappaports' house and looking almost identical, was the haus kuk in which the "workboys" lived. "When I was finally able to walk again, I wanted to explore the village. The only thing I found were a few wandering pigs and some very low houses. I was puzzled as to where the local people lived. Nobody had told me what the Maring houses looked like. I only found out when we got to Gunts."